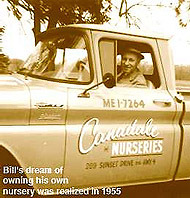 The History of Canadale Nurseries Ltd. The Canadale story begins with Bill and Joan Intven. When Bill proposed to Joan Somers in Brabant, Holland, he told her he hoped to share two dreams with her — to immigrate to Canada and to own his own nursery. These dreams had roots in his mother’s garden, where she taught him many skills like budding roses and pear trees. Joan accepted, and in 1950 they sailed across the Atlantic with just $300 and a year’s supply of food and clothing for their growing family. Once they arrived, Bill spent a year at McConnell Nurseries, the largest nursery in Canada at the time, and he specialized in mail order. He then took a factory job in St. Thomas, Ontario to ensure a steady income for his family of seven. Bill spent his spare time in his back yard, propagating young plants in makeshift cold frames and preparing for the day when he would have his own farm. The day finally came in April of 1955, when the Intven’s purchased the derelict McManus tobacco farm. Stock was soon planted and retail sales began with Joan selling bare root privet hedging from a wheelbarrow along the highway. Out of respect for their newly adopted country, they decided on naming their business Canadale. The Intven’s love of plants and their fervent desire to please their customers quickly ensured a loyal following of ardent gardeners. With a strong commitment to offering quality plants at reasonable prices, the business grew steadily throughout the 60s and 70s. In 1977, Bill and Joan’s son, Tom, graduated from Queen’s University with a degree in plant biology. He dove into the family business full-time, and rapidly expanded the production of the nursery and increased the wholesale division. Their daughter, Pauline, and after graduating with two degrees from the University of Western Ontario in 1984, she began managing Canadale’s garden centre. Many of the family’s third generation including Tom’s and Pauline’s children, as well as several nieces and nephews, have worked in the garden centre or nursery over the years. Tom’s daughter Kate is currently a supervisor in the garden centre. Furthermore, Canadale gained new “family members” through their long-time, dedicated staff including Jim Stinson, Rob Parmeter, Rick Graham, Shane Good, Jeff Haveron, Lesley Livingstone and Connie Silcox. Their loyalty and unwavering commitment to providing quality products and services, helped shape Canadale into the successful company it is today. Sadly, in May of 2002, Bill Intven passed away with his family at his bedside. Over the many years of running Canadale, Bill instilled in his family an appreciation and love for nature which, he believed, is at the very heart of gardening. For Bill, the essence of this fascination, with the complexity and wonder of the natural world, was encapsulated in a single seed. Each and every spring, he marveled at the sight of his newly emerging seedlings. Through hard work, honesty and integrity, Bill was lucky enough to see his business receive two significant awards: The Better Business Bureau of Western Ontario Business Integrity Award, and the Landscape Ontario Consumer’s Choice Award, awarded to Ontario’s Favorite Garden Centre. After Bill’s passing, Joan was very happy to watch the business flourish. She continued to get regular updates on the day-to-day operations, offering her valued opinion and advice. Joan passed away peacefully on January 9, 2015. She will be greatly missed by her extended family and the St. Thomas community.